Desperately Seeking Surnames, Genealogy and Family History: Have Irishman...Need family - Is this him? I was given this photo by Sally J. Conlin who believes it to be either Martin John Conlin (1828-1896), the Irishman in a previous post, or his son Michael Conlin (1866-1936). I am thrilled to have the photo regardless of who it is. It would be especially nice to know for sure though! It may be possible to narrow down the date if I focus on the photographer J.C. Gardner. I found a Johnson C Gardner in the 1900 and 1910 Brookfield, Linn County, Missouri census' with the occupation of a photographer born in Pennsylvania about 1844. 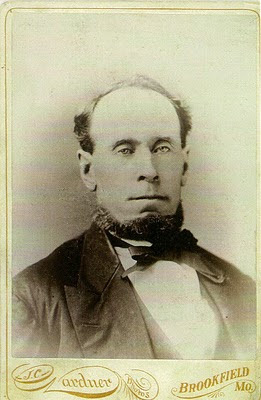 His wife was Elizabeth born 1850 in Pennsylvania. I did not find Johnson in the 1880 census, however there was a Steven C Gardner born in Pennsylvania about 1844 with photography as an occupation. His wife was listed as Elizabeth born in 1850 in Pennsylvania. With the time-line information on the photographer, it is possible that the photograph could be of either Martin or Michael. I was hoping to rule out one or the other, but that doesn't appear to be the case here. More research to do! I surely wish I could help you. I have Irish ancestry, but couldn't prove it to save my life. Good luck in your search.